Located just a few meters from the Archaeological Museum of Agrigento, this church appeals to the want of simplicity. Built by the Cistercian monks in the 13th century, the structure displays Romanesque as well as Gothic style. It is built from the same golden rocks as the Valley of Temples, as the unfinished Temple of Zeus provided easy material. This golden yellow stone charms the interiors, making them bright, and pleasant. Outside the church is a lovely view of the ruins of an amphitheater and a garden that overlooks the Valley of Temples. It is just a few meters away from the Museo ArcheologicoRegionale di Agrigento. City buses 1, 2 and 3 to stop- the Valley of the Temples. How popular is San Nicola? People normally club together Valle Dei Templi and Parco Archeologico E Paesaggistico Valle Dei Templi while planning their visit to San Nicola. Love this old small church. There is a long waiting list of you want to te married here. 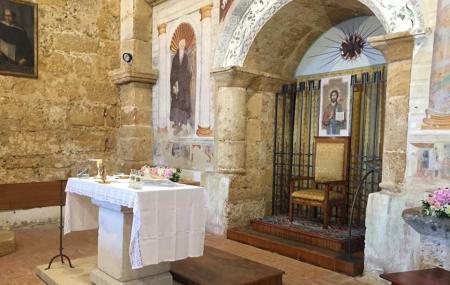 Nel visitare la valle dei templi, occorre fare un piccolo salto per visitare la chiesa di San Nicola e tutto ciò che ci sta intorno. Consigliato se avete una giornata intera da trascorrere nella valle dei templi.